Anna Grace, an adorable little girl and a beloved daughter, has met with pain and struggle in her young life - and has ridden down her adversity, literally. Anna Grace was adopted through Children's Hope Russia Program at 19 months, along with her brother, by parents Teresa and Tony Vancil. When she was 4 years old, she was diagnosed with cerebral palsy. 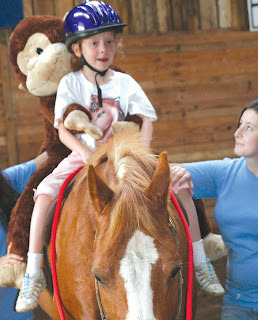 Doctors and therapy appointments were tried, but it wasn't until Anna began riding horses that the Vancil's would learn that four legs could be such an amazing help to Anna's two. Read the full story of Anna's adoption and her equestrian therapy at Marshall County Tribute-Courier online.